Nonpartisan ethics watchdog American Oversight today filed a lawsuit against the Department of Housing and Urban Development (HUD) to find out how much taxpayer money Secretary Ben Carson spent redecorating or renovating his office. According to a Guardian report, a former HUD official was demoted and told “$5,000 will not even buy a decent chair” after she objected to the secretary’s lavish redecoration plans, and the New York Times separately reported that Carson spent over $31,000 on a dining set for his office. President Trump’s proposed 2019 budget, which was released earlier this month, calls for $8.8 billion in cuts to the HUD budget, including cuts to the Section 8 housing subsidy program. In November 2017, American Oversight submitted Freedom of Information Act (FOIA) requests to 23 Trump administration agencies, including HUD, seeking records of any expenditures for office renovations for senior officials. HUD failed to respond to the information request as required by law, so American Oversight filed suit today in the U.S. District Court for the District of Columbia to compel the agency to release the requested documents. 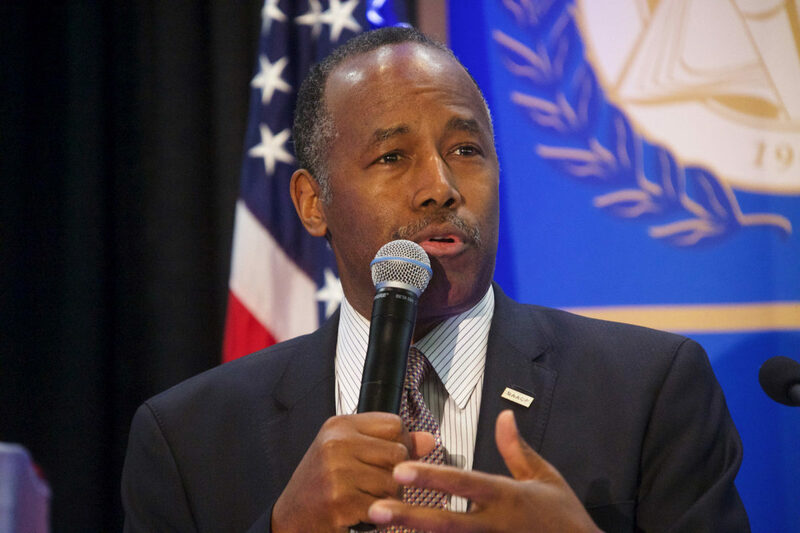 Secretary Carson drew criticism earlier this month after investigative reporting and documents uncovered by American Oversight revealed that he had allowed his son, Ben Carson Jr., to take a prominent role in coordinating an official HUD visit to Baltimore. An analysis of the emails we obtained showed that Carson Jr. used the opportunity to further his own business interests, connecting business associates with senior HUD officials and setting himself up as a conduit for those seeking to influence his father. American Oversight sent a letter to the HUD Inspector General on February 21, 2018 calling for the agency watchdog to thoroughly investigate Carson Jr.’s role at the agency. The revelations about Carson’s attempt to spend lavishly on his office furniture followed news last week that EPA Administrator Scott Pruitt has regularly flown first class at taxpayer expense, potentially violating federal travel rules requiring government employees to travel on the lowest priced tickets available. American Oversight has sent a FOIA request to the EPA seeking copies of any waiver requests that Pruitt submitted regarding his first class flights.